← The Written Word by Hand or Blog? When this door closes it will benefit under-privileged, economically challenged and at-risk young people through La Buena Vida Foundation, a non-profit organization serving the greater Irving area. 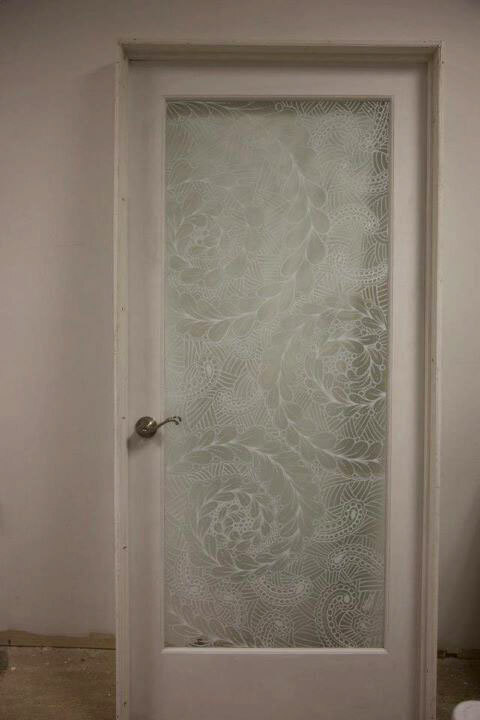 I tangled this interior, glass-paned door for charity on behalf of Googly Eyes Art & Craft Supplies where I teach classes in calligraphy and Zentangle® drawing techniques. There were a total of 8 doors decorated by participating artists which will go to auction to benefit La Buena Vida Foundation. I accepted the challenge of drawing on glass with a white enamel paint pen. While I had more than 3 months to paint the door, the project was actually started only 4 days before the opening reception featuring the embellished thresholds. I also had no idea of what to do on a glass door! Then, under the pressure of procrastination, my creative mind kicked in. After measuring the pane of glass, I went to my iMac and created a basic spiral design or “string” to tangle in Adobe® Illustrator – a vector-based drawing application. The digital file was then emailed to Kinko’s for an extra large, door-sized laser print-out on white paper. I set up the door in the back room of Googly Eyes Art & Craft Supplies and secured the paper print-out to the back of the glass panel with clear packing tape. My Art Music playlist (Intermedium by Kostas Moustakas, one of my favorite songs) set the pace as I picked up the new paint pen and tangled the entire glass panel for almost 4 hours. I wanted to keep the patterns very simple, so I only used two of the official Zentangle patterns known as Flux and Shattuck, plus my own version of Flux called Paizel. I think the overall look of the white enamel paint on glass successfully resembles etched glass! What do you think? WOW! This is amazing! I love it. My first thought was that it was etched glass! I just starting zentangling on a canvas last night… it’s really satisfying to work on a substrate that BIG! AV Graphics · Create your day wonderful!